The Malta Tourism Authority is to give financial help to Din L-Art Helwa for the restoration of the statue of St Paul on St Paul’s Island. The sponsorship agreement was signed this morning in the presence of Tourism Minister Edward Zammit Lewis, who said that collaboration would be taken further, as these islands had the potential to be developed into an attraction for tourists. The minister said the tourism product did not depend solely on government investment, but he also spoke on the importance of other ministries continuing to invest in areas such as Bugibba, It was for this purpose, he said, that the National Committee for Tourist Zones had been set up in a coordinating role. 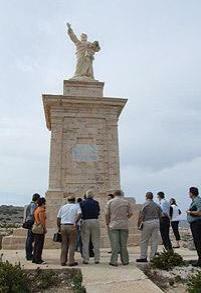 The weather-beaten statue of St Paul was last restored by Din l-Art Helwa seven years ago in a project financed by Vassallo Builders. The statue was inaugurated and blessed in September 1845. It is the work of two sculptors, Sigismondo Dimech (1780-1853) of Valletta and Salvatore Dimech (1805-1887) of Lija. The statue stands about four metres high and represents St Paul holding a book in his left hand while holding up the right one. At his feet lies the viper which, according to the Acts of the Apostles, came out of the fire and bit his hand. The statue stands on a platform 8.3 metres high, the work of Francesco Spiteri.